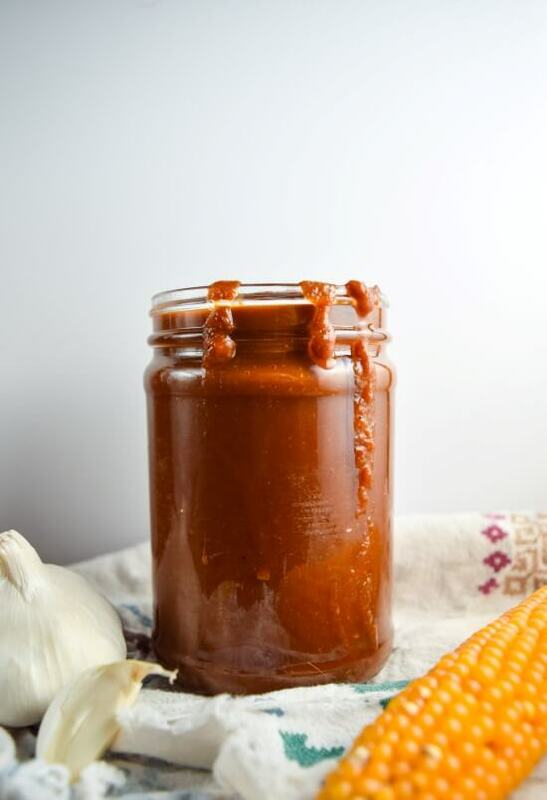 Sriracha and Roasted Garlic BBQ Sauce | yupitsvegan.com. 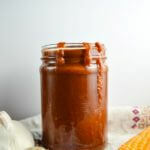 We like making homemade BBQ sauce because you can control the ingredients just to your liking – and it’s a lot cheaper! J leans more toward super sweet, sticky BBQ sauces that are made of equal parts sugar and vinegar, and not a lot else. It’s delicious in its own way – kind of like a western sweet and sour sauce. I personally prefer something more naturally-sweet and with darker, deeper flavors. Think molasses, tamarind, lots of spices and a slow-burning spiciness. Which is where the sriracha comes in! This sauce is definitely spicy, but not in an overpowering or overwhelming way. However, individual tastes vary, so play it by ear according to your preferences. BBQ sauce is meant to be lovingly prepared, tasted many times and seasoned until it’s just right. Roasted garlic is also an amazing addition to BBQ – I’m not sure I would have thought of that myself if not for Trader Joe’s. Roasted garlic has so much sweetness to it, but also an intense umami flavor. It’s no secret that I love the stuff 🙂 I’ve put it in tofu quiche, creamy pasta sauce, and white bean stew. And this sriracha roasted garlic BBQ sauce certainly won’t be the last time it makes an appearance! Most of the time I make my own, but this time I caved and bought some pre-roasted at the store. If you do so, look for one without added preservatives or ingredients other than garlic, oil, and salt. Other additives will unfortunately, change and sometimes totally dull that sweet garlicky flavor. You can totally make your own sriracha, too! This isn’t the first Trader Joe’s item that I’ve reversed engineered. My homemade soyrizo recipe is still one of my all-time blog favorites! Come to think of it, I’m sure you could devise some sort of delicious BBQ soyrizo nachos or something along those lines… :). I’d love to know if there are any other vegan Trader Joe’s favorites that y’all would like to see made into a homemade version! It's easy and cheap to make BBQ sauce at home! This roasted garlic sriracha BBQ sauce takes umami flavor to the next level. Add a small drizzle of oil in the bottom of a saucepan over medium-high heat. When warm, add the diced onion and fresh garlic and stir. Cook for 5-7 minutes, stirring occasionally, or until the onion is softened and slightly browned. Add smoked paprika, cumin, and black pepper, stir, and cook for about 60 more seconds or until fragrant. Remove from the heat. Use a rubber spatula to add the saute mixture to a blender along with the roasted garlic cloves and apple cider vinegar. Blend until completely smooth, adding some of the tomato puree if needed to blend. Pour the blender mixture into a saucepan and and all of the rest of the ingredients, except for the liquid smoke. Bring to a boil and then reduce to a gentle simmer. Simmer the mixture for about 30 minutes, stirring occasionally. Stir in the liquid smoke and taste for seasoning (like more sweetness, acidity, salt, or spices). If you want a super smooth sauce, you can blend it again in batches or with an immersion blender. Let the sauce cool completely before storing in the fridge (it's even better the next day!). Leftover BBQ sauce will keep for at least a week. If you can't or don't want to get vegan Worcestershire sauce, use 1 tbsp additional soy sauce plus (if you have them) a pinch each of ground ginger, ground allspice, and ground nutmeg. 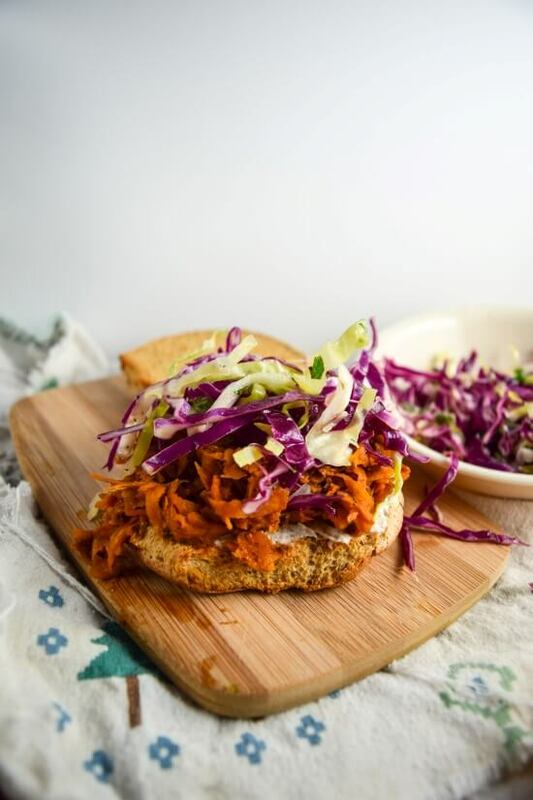 Adapted from the basic BBQ sauce recipe in But I Could Never Go Vegan! 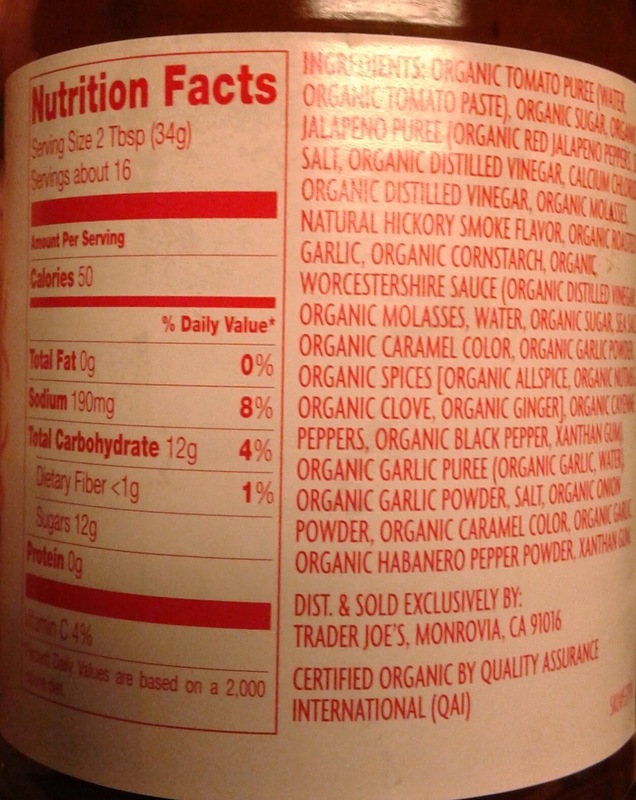 and from the Trader Joe’s Sriracha and Roasted Garlic BBQ Sauce ingredients list. This post contains affiliate links. Read my advertisement policy for more information. This looks so awesome! I cant wait to see the sandwich recipe! I love Trader Joe’s, but I have yet to try their sauce, maybe I will drop by tomorrow! The sauce looks incredible – garlicky, sweet, spicy and a whole lotta yum! Btw, another favorite local dish of mine is spreading bbq sauce all over roasted or boiled corn, so good! This combines so many of my favorite things in one! <3 Can't wait to try it out! Thanks 🙂 hope you enjoy! Yay! So thrilled to have a recipe for this sauce! 🙂 I can’t say it tastes exactly like Trader Joe’s but it’s delicious just the same! Sorry I didn’t add the amount to the original recipe. It makes about 4 cups of sauce. Some like it hot, and so do I! 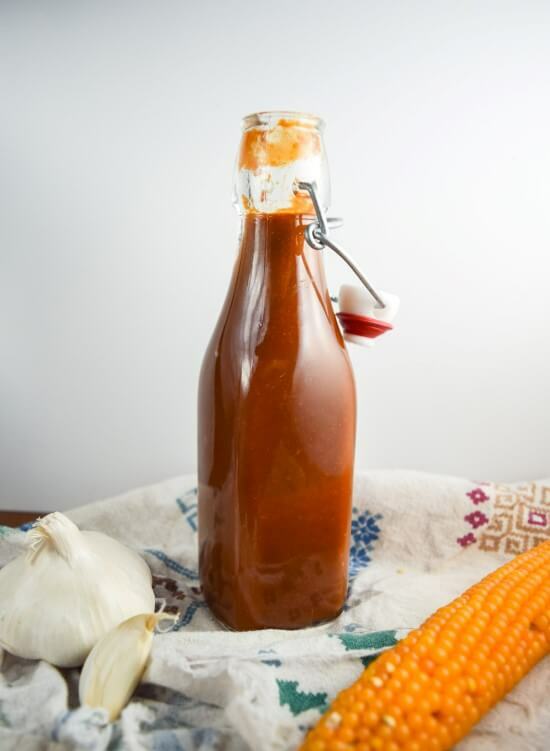 I love the taste of Siracha but I find that most brands have additives that I prefer to avoid, so making your own hot sauce and BBQ sauce makes much more sense. Thanks for sharing this delectable post! I am pinning and sharing it.